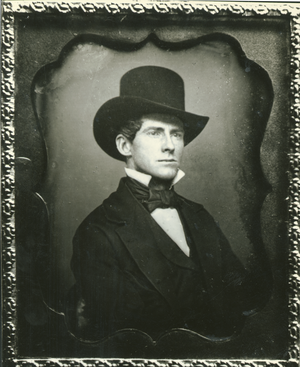 When the Massachusetts Agricultural College was being developed in 1867, Levi Stockbridge became the farm superintendent and an instructor in agriculture. As professor of agriculture from 1869 to 1880, he had a hand in the development of the Experiment Station. He was well known for his work on improving crop production and for developing formulas for mixing fertilizers. 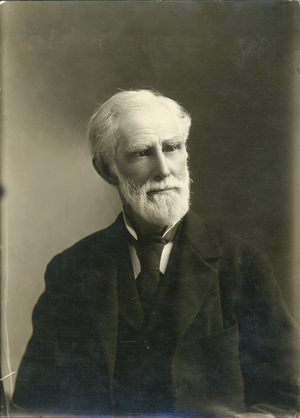 Stockbridge was appointed President of the College in 1880, serving for two years. The college survived through great financial stress during his tenure. Amid the budget difficulties, Stockbridge advocated for more scholarships for students and greater investment in the college’s physical plant. In 1882, he retired from the College, and was named an honorary professor of agriculture. Stockbridge was born in Hadley, Massachusetts, in 1820. He was active in local politics, winning a seat in the Massachusetts House of Representatives in 1855, 1870, and 1883, and in the State Senate for 1865-66. In 1880 he ran for a seat in the U.S. Congress on the Greenback ticket. He was also a town selectman, town assessor, and town meeting moderator in Amherst. Stockbridge Hall, built in 1914, is named in his honor. Cary, H. (1962). The University of Massachusetts: A History of 100 Years. Amherst: University of Massachusetts Press.